A device that transforms an iPhone into an FDA-approved heart monitor began shipping to US healthcare professionals this week. AliveCor's Heart Monitor costs $199, requires a free app from the iTunes Store, and attaches to an iPhone in much the same way as many of the iPhone cases available. Patients place their hands on the device's two built in sensors and it picks up and records electrocardiogram (ECG) rhythms, communicating the information wirelessly to the iPhone. The company warns that the Heart Monitor is not meant to replace traditional 12-lead ECG machines, but says it will provide “quick, accurate rate and rhythm assessment”. “At this time, AliveCor's Heart Monitor does not provide any diagnosis. A trained professional should read and diagnose any ECG rhythm data,” the San Francisco-based company said. The device is initially only intended for use by healthcare professionals, although it wants to open up sales to the general public and international markets. 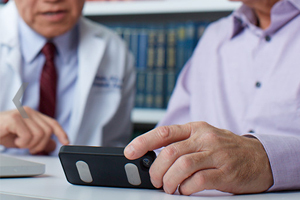 When AliveCor gained 510(K) Class II clearance from the FDA for the Heart Monitor in December 2012, the company's CEO Judy Wade told MobiHealthNews it will encourage doctors to prescribe the device to heart patients, potentially at a cost of $99. The device's approval marks a big step forward for mobile health, although it will take time for AliveCor to make it more widely available. The version that's on sale in the US is only approved for use with an iPhone 4 or 4S that's running iOS 5.1. The firm said it hopes to receive FDA approval for an iPhone 5 compatible version by the second quarter of this year. AliveCor has been rather more coy about its plans for a tablet version but says an Android compatible device should be available in the third quarter, assuming it receives FDA backing.